Wheat claims more farmland than any other crop cultivated by mankind. It's the most traded grain on the planet, with upwards of 700 million tons harvested on a yearly basis to meet the needs of the Earth's ever-growing population. It's the "amber waves of grain" in the "America the Beautiful". In my long and storied snackology career I've never met a single person that carried around a sack of raw wheat, pulling out handfuls and munching enthusiastically as they go about whatever sort of insane business that sort of person would have on the table. That's not to say those people don't exist. I've just never met them. I assume they don't have the internet; otherwise they'd have just ordered pizza. No, wheat is something we husk or shuck or hull or whatever they call it, leaving the grain proper behind, ready to be puffed, ground, boiled, microwaved or fried into more pleasing shape (sure, fried wheat, why the hell not?). What does wheat taste like? For millions of Americans, wheat is a slightly salty crunch followed by a hint of sweetness. Wheat tastes like Nabisco's Wheat Thins. Or possibly Wheaties cereal, but over the years that's picked up the flavor of Bruce Jenner and Mary Lou Retton. And you aren't fooling anyone, Cream of Wheat. The Wheat Thin is the perfect little wheat delivery platform. A baked wheat flour cracker with a hint of sugar and salt, the Wheat Thin is much more than a snack crisp: it's a symbol of our great nation. You know, the middle bits, where everyone sits around quietly growing things and dreaming of one day making it to the big city to become famous like Sandy Duncan. You can taste the hand of these people in every bite. Luckily their hands taste like wheat as well. Unfortunately, progress has left those hardworking people in the dust. America has begun to take the Wheat Thin for granted. They are plain and simple in a world that wants more. Our razors have seventeen blades. Our toilet paper has so many plies our pristine fingertips get lost within its cottony folds. We are a fancy planet, and Wheat Thins are just not fancy. 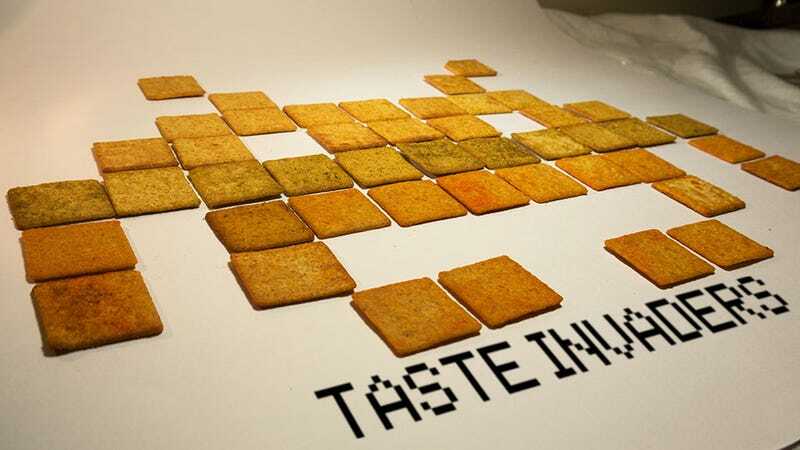 How you like Wheat Thins now? The yellow section of the cracker aisle has received a splash of color in the form of flavored Wheat Thins, masking that traditional taste with powered food product that attempts to mimic younger, hipper food products. You want a kick? Trying the Spicy Buffalo. You want to feel vaguely like you're getting a sandwich at Panera? Sundried Tomato & Basil. You feeling tangy? What the hell does that even mean? Have some Wheat Thins. With so many flavors to choose from these days, it's dangerous to simply head out to the store uninformed. You might end up at a shopping center like Kroger, which didn't have any of the Ranch flavor available for purchase or worse — you could end up dead. You need a board certified snackologist for a decision this big. I'm here for you, baby. Let's do this. The classic Wheat Thin flavor always surprises me. It's the sugar — I never expect there to be a sweet kick following the salty bite. Sweet and salty is big right now, but Nabisco's been doing it for years and in such a wonderfully subtle fashion. In a way it's a deconstruction of wheat in general. Wheat is beaten into bits and made into a consumable form. Then we crunch it and chew it down to its component molecules again. We are the creators. We are the destroyers. The Wheat Thin is the essence of humanity in a tiny golden brown baked square. Adding sundried tomato powder to the normal tomato powder found in two of the other test varieties does wonders for the taste of Sundried Tomato & Basil Wheat Thins. As in, I wonder why this one doesn't taste good? The answer? There's no fresh mozzarella. This wants to be a caprese salad chip, but it's missing that vital component. Sprinkle a little cheese dust on these to offset the potent powder combination and then we might have snack worthy of the Wheat Thin brand. As it stands, this is the Smoky BBQ without the sweetness; the Spicy Buffalo without the bite. Throw in a bitter basil aftertaste and you've got the worst of the lot. The second of three tomato-based Wheat Thins flavors, the Smoky BBQ is a regular thin dusted with a sweet and musty coating of mustard-based sauce powder. The smoky, in this instance, is conveyed by mildly burnt taste, as is often the case with snacks carrying that particular adjective. It's a good taste, but not a perfect one. Where the original Wheat Thin holds a subtle sweetness, the BBQ sauce powder layers additional sweetness on top, upsetting the perfect balance just enough for me to wrinkle my nose derisively. The third and final tomato-based offering adds a strong vinegar heat to the equation, a mild pleasant burn of the sort you'd fine on your better hot wings. It's not overwhelming. If anything the flavor gives way to the signature Wheat Thins sweetness too soon, teasing the tongue with fire and then drizzling it with honey. It's a borderline sadistic chip that just isn't ready to commit to its alternative lifestyle. A burst of green pepper flavor was the last thing I expected when I popped my first Zesty Salsa Wheat Thin into my mouth. I was thinking tomato, and Nabisco threw a curve ball. There is no tomato here (well, not in quantities significant enough for it to make it onto the ingredient label, at least). This is salsa verde. Now I cannot eat regular salsa verde, as it never fails to give me intense heartburn. These crisps give me the flavor I love without the pain I secretly adore. I don't have to worry about waking up in the middle of the night running to the bathroom. This is just wheat with a wonderfully spicy kick, and wheat never hurt anyone (that I know personally). Part of me is highly disappointed in Nabisco for feeling additional flavors of this classic snack chip were necessary. Sure, Wheat Thins might not be as appealing to the younger crowd as sticking large bits of metal into their bodies, but those younger people will grow up one day, and it's a scientifically proven fact that Wheat Thins taste better the closer you are to death. I can, however, understand the need to be accepted and loved by as many people as possible. I'd like to think I'm the same person I was two decades ago, but I know the truth: I've changed key aspects of my personality to suit the people I've been with. I've researched new topics to appeal to their interests. I've changed my favor for love. And if I had to do it all over again? I'd change that flavor to Zesty Salsa.